NEW YORK (AP) — The WNBA’s logo is getting a new look and the league is resetting its brand for the upcoming season. “We are excited about all of it,” WNBA chief operating officer Christy Hedgpeth said by phone last week. “It starts with our purpose, which is to expand our audience and grow at a faster rate. 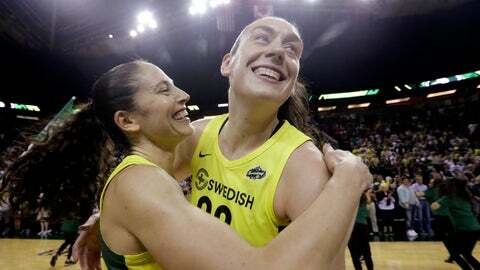 The WNBA’s 23rd season begins May 24, with the Seattle Storm the defending champion. The two groups, along with player input, came up with the league’s new logo. It’s the first time the league will have a new logo since 2013. While the new logo won’t be on the uniforms or balls until next year because of the lack of production time needed to do it, it will be everywhere else around the league. Hedgpeth insisted that the logo wasn’t modeled after one player and that the hair was a huge part of the conversation. The logo has a bun which represents the way many players wear their hair.